Truck drivers have one of the most strenuous jobs, one which entails sitting on the driver’s seat for long hours and focusing constantly on the road. It is no surprise that truck drivers often suffer health issues caused by lack of movement on a regular basis. Blood circulation suffers due to those long hours spent in the truck cabins except the occasional turn of the steering wheel and pushing of the accelerator and brake pedals. Truck drivers are known to work 12-hour driving shifts which is a lot of time to sit in one place without much movement. Since driving is a part of their job description, truck drivers can’t escape the health consequences of driving long hours. However, certain items like compression socks can help with blood circulation issues and alleviate some of the health problems faced by them. 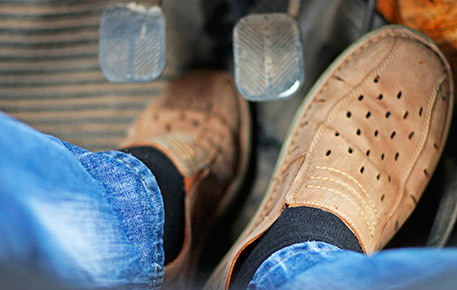 Compression socks are useful to prevent and treat a variety of leg problems mostly found in drivers who have to spend extended time behind the wheel. The professionals at Comfort Stride Foot Care Clinic in Toronto have listed down some concrete reasons for truck drivers to give compression socks a try in order to maintain their health on the road. One of the most visible benefits of compression socks is that they prevent the discomfort associated with spending day after day on the road. Compression socks are designed to help with blood circulation and are also used to deal with vibration. Truck drivers experience vibrations in their legs constantly due to the movement of the truck which can cause serious ill-effects. Wearing compression socks will not only help with negating the effects of vibration but also prevent cramps occurring due to lack of blood circulation. Cramping is the beginning of serious health problems if left untreated for long periods of time, so it is wise to deal with leg cramps as soon as possible. Plantar fasciitis is a condition in which the tissue running in the bottom of the feet gets inflamed due to excessive stress. Truck drivers are known to spend over 12 hours in the driver’s seat and have almost all of their weight concentrated on their heels. This large amount of sitting leads to higher chances of developing plantar fasciitis. Many drivers are found to be suffering from this condition due to lack of adequate care. Compression socks can ease this condition by improving blood flow, leading to faster healing and can also provide vital support to over-exerted muscles helping in preventing further problems. Deep Vein Thrombosis poses one of the most major health risks to people with a tendency to sit for extended periods of time and hence, drivers are naturally at a big risk of developing this condition. Due to a lack of movement for extended periods, blood clots can form in the veins of legs and can travel to the heart increasing the possibility of a stroke. Compression socks are known to help with blood circulation and thus, help in the prevention of blood clot formation in the legs. If style and fashion are the major concern, then it’s vital to note that athletes and runners have been using compression socks for quite some time now and it is becoming more of a trend these days. With increasing interest in the health benefits of compression socks, many companies are competing to make socks which are stylish as well as functional so that you don’t have to worry about other people noticing your compression socks. So, here you have it, the various benefits of compression socks. Compression socks are highly advised to ensure long term health of truck drivers even with their sedentary lifestyle. If you are suffering from leg discomfort or plantar fasciitis, Call the certified foot care professionals from Comfort Stride Foot Care Clinic today at 647-560-1030 or Contact us to book a consultation at your first convenience.